Attention all you regional gadflies. Lace up your walking shoes. Straighten that bow tie. Restock your righteous indignation. It’s go time! Friday, the stars will align to make it easy to attend three separate public hearings – all in the San Gabriel Valley. (OK, you may need a car.) I’m talking meetings on regional issues such as light rail and freeway construction; the state budget gap and funding for schools and universities; and the coup de grace of meaty, we’ve-been-waiting-for-a-decade, issues: redistricting. If I’ve lost you, I humbly apologize. You’re free to follow a new conspiracy theory now that the president presented his long-form birth certificate. You celebrity lovers are probably woozy from staying up all night watching the latest royal wedding, or staking out Lindsay Lohan’s courtroom – same thing. Not me. I’m a political junkie. More, I love policy stuff. More importantly, I am a San Gabriel Valley advocate. I don’t see through parochial eyes like many in our Valley who are gadflies only of their local city council. No, this is big picture stuff. I squint west, from the edges of Little Tokyo to the county line in Pomona, to the Puente Hills and back up through San Gabriel Canyon. 8 a.m. El Monte Aquatics Center Multi-Purpose Room, 11001 Mildred St. The State of Transportation in Los Angeles County. I’d like to know when that HOV lane on the 10 Freeway will be completed, not to mention the new transition to the 605 Freeway. I understand it will cost you to use the HOV lane in a single-occupant vehicle. I can’t wait to see how that works. Habib Balian, CEO of Metro Gold Line Foothill Extension, will talk about how the construction is going and oh yeah, ask him about that maintenance yard issue. John Fasana, the SGV cities’ representative on the Metro board, will talk about the 710 Freeway completion – isn’t it a gazillion-dollar tunnel project now? Tim Spohn will address the Alameda Corridor East projects (grade separations to allow cars and trains to move freely). 1:30 p.m., the state Senate Budget Committee will meet and take testimony on the campus of Cal Poly Pomona. Way cool. I can’t remember a committee from Sacramento meeting – for real – no dogs and no ponies – to discuss how to balance the state budget. This is the most important issue in Sacramento today and they’re coming here to our Valley to talk about it. Here’s a golden chance to tell them how to run the Golden State. The two Republicans who’ll attend, Sen. Bob Huff, R-Diamond Bar and Sen. Bill Emmerson, R-Hemet, could add significance, since the governor needs two GOP lawmakers from each body to approve his budget and tax extensions. How will you recognize the two Republicans? They are the ones with the bull’s-eyes on their backs. Seriously, the CSUs will be there to argue against yet another $500 million cut, which is what will happen in a “cuts-only budget.” The CSUs already are getting whacked by $500 million, part of the $11 billion in cuts already approved by the Legislature to bring down a $26 billion deficit. Brown and the Democrats want to make up the rest with an extension of tax hikes plus cuts in pensions for state employees. If not, the CSUs will go down to 1999-level funding and must absorb a hit of 35 percent of its state funding. 6 p.m., California Citizens Redistricting Commission public input hearing, San Gabriel Mission Playhouse, 320 Mission Drive, San Gabriel. Gadflies, you’ve hit the Mother Lode! These guys are asking you where to draw the lines for Assembly, Senate and congressional districts! You can tell them for starters that we want districts with communities intact, not hacked into poodle or leopard shapes. We will give them the 59th Assembly District, which lumps Monrovia and many San Gabriel Valley communities in with Twin Peaks, if they’ll give us back something that serves the people, not safe districts that serve the politicians and help them get re-elected. Let’s all go to these and report back. In the words of Harry Truman, give `em hell! Enthralled and perhaps nature-starved New Yorkers are climbing into sightseeing boats for a chance to glimpse a wild harbor seal. In a fascinating article from the The New Yorker magazine (March 21), Ian Frazier writes of the popular return of the sea mammal to New York Harbor. One New Yorker named Milissa can observe the animal frolicking in the wild from her kitchen window – possibly a first in modern NYC history. While the return of the seals to the heavily trafficked waters off Manhattan and Staten Island is a testament to environmental laws protecting seals and successful efforts to clean up New York waterways, the reaction from the watchers – we human beings – is much more fascinating to me. As the article demonstrates, we humans can never get enough of nature. And when nature is right in our backyard, we go ape. The article brings to mind the re-opening of the main roadway into the Angeles National Forest – Highway 39 last month, in fact, around the same time Frazier’s article was published. Now, anyone with a vehicle can drive Highway 39 about 26 miles up to Crystal Lake, the only natural lake in the entire San Gabriel Mountains. It is the first time such access has been granted in nine years, ever since the Curve Fire smoked the landscape and resulted in debris flows that badly damaged the road. San Gabriel Valley folk wasted little time taking advantage. They’ve been making the relatively easy drive since the end of March. It’s sure to become a popular camping spot come June when (or if?) 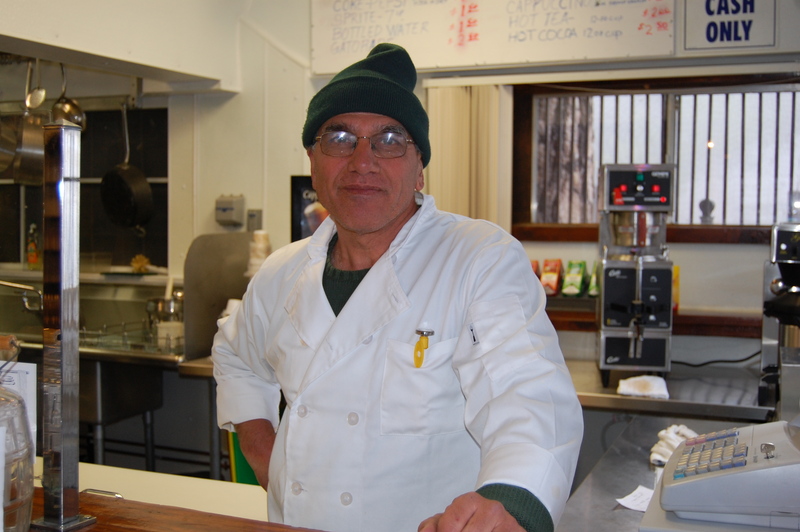 the Forest Service grants a concessionaire the contract to re-open the nicely refurbished campground. 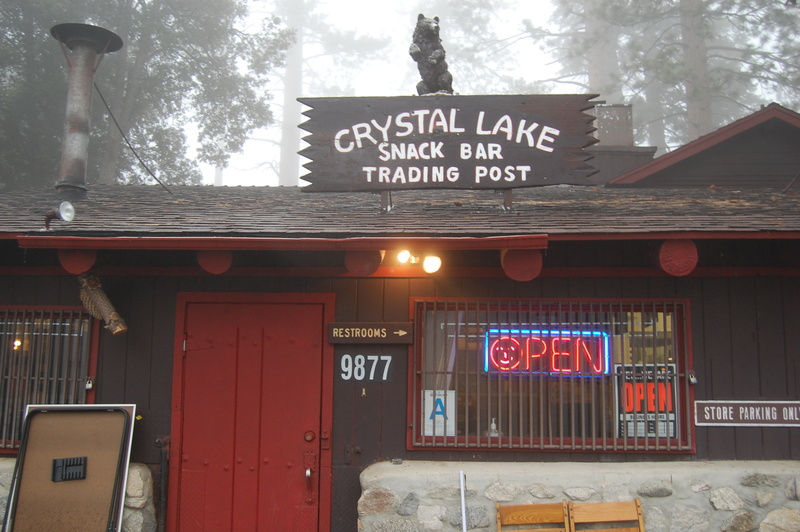 After a quick drive up the fogged-in mountain last Thursday, I found a steady stream of visitors at the Crystal Lake Snack Bar swapping stories about how they used to come up here when they were kids. Two young anglers cast their lines into the lake in hopes of catching a trout. The irrigation system has been re-tooled, allowing more natural spring water to recharge the small lake. Because of the fog, views of nature that day were limited. Though it’s certainly possible to see a black bear or mountain lion, you’re more likely to spot a mule deer or a red-tailed hawk. In summer, rattlers are out and I recall a past visit in the 1980s when a ranger nudged me to move my hand which was leaning on a rock. The rattlesnake was curled in the cleft. Crystal Lake has nothing on the big reservoir lakes in the northwest range, such as Castaic, Pyramid and Bouquet. But the 5,000-feet elevation and the close proximity to this pristine world will literally take your breath away. Just to the west, Angeles Crest Highway is still closed but that could be opening up soon, sources say. Until then, visitors are flocking to Chantry Flat; the road to it (starting above Arcadia as Santa Anita Avenue) is in near-perfect shape. The trails into Big Santa Anita Canyon lead hikers on a must-see journey through some of the greenest, wettest sights of the last few decades. The steady rains of the past seven months have wrought new seedlings and spawned trout in the creek. Owens says a plentiful acorn crop in the fall nurtured by steady rainfall of 45 inches (normal is 35 inches) produced a plethora of oak seedlings. “It’s as if the trees knew they were going to have this kind of winter,” Owens said. I haven’t been up there in a few months, mostly because of the crowds. On a weekend, you have to get up there before 7:30 a.m. to snag a parking spot. So I will take his word for it. But whether it’s to see the new trees and latest wildflower upcroppings, or what Frazier calls the “charismatic megafauna” or animals that are cute and therefore appeal to human nature (seals have big, doe eyes), the draw of nature is a multi-pronged animal. It can’t be overstated. 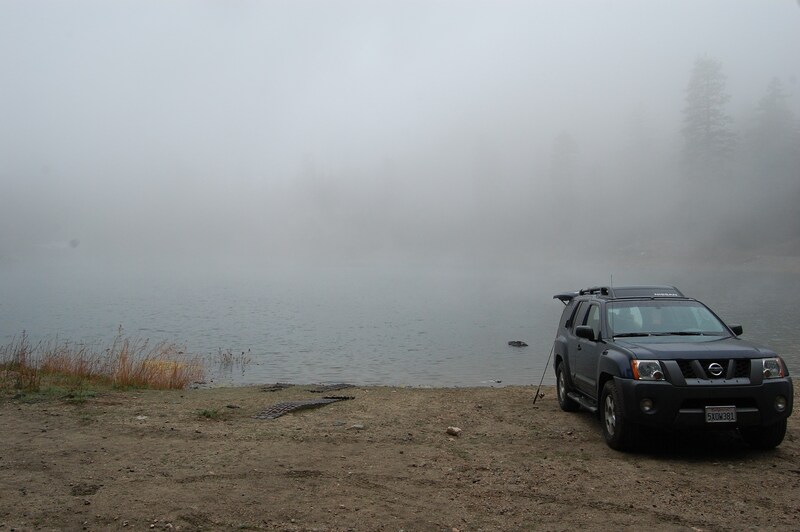 Two guys from the Pasadena-La Canada Flintridge area take their Jeep down to the lake during a foggy, cold Thursday afternoon. The chilly day of fishing didn’t result in any bites. But the eerie, peaceful confines of Crystal Lake did produce the desired effects. The road from Azusa, Highway 39, is now open all the way to Crystal Lake road. The campground is not yet open. Forest Service folks say that won’t happen until May or so. Dear Monrovia: Why not claim Peck Road Park as your own? I like the idea. Appreciate the passion. Jason, you’re right. The city parks are mostly in the north of town. As someone who lived in your city for 14 years, I’m with you. But realistically, there’s not a piece of land, nor enough money “or grants” to build a new park. The state is cutting, cutting, cutting and may even take away the city’s redevelopment monies because no one wants to raise taxes. Heck, the GOP won’t even agree to a ballot measure to extend the same taxes we’ve had for the past two years. Pensions are out of control, eating up city budgets. And city services are suffering from paying top managers too much money. Sooooo, it’s rare to see any new parks emerge. But if you are serious about this idea, let me suggest you get behind Peck Road Water Conservation Park. It already exists. The only problem is no one knows about it. What, you’ve never heard of this park? That’s funny, because it is located just a few thousand feet south of Live Oak Avenue, just off Peck Road, on a sliver of land that’s technically Arcadia but abuts county-unincorporated Monrovia, Irwindale, El Monte and is a stone’s throw from Temple City. So, Monrovia, since you brought up parks, you get first crack. Here’s my proposal: Make Peck Road Park yours, too. How? Start using it! It is so close to the residents of Monrovia and the county unincorporated MAD area (Monrovia, Arcadia, Duarte) that kids can walk or ride their bikes there. Families could picnic or barbecue there. The lakes are filled with water year-round. The bird population changes with the seasons but it’s very common to see gulls, egrets, green herons, cooper’s hawks and black phoebes, according to a report released by the San Gabriel and Lower Los Angeles Rivers and Mountains Conservancy (RMC), the agency that funnels grant money for parks and green space protection. Start the South Monrovia Bird Watching Group. 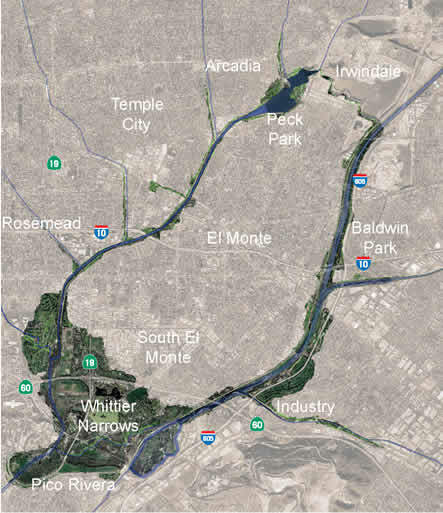 How about the South Monrovia Parks Coalition, which will raise money for park improvements? It just so happens that on Monday, the RMC board approved a $600,000 grant to the Los Angeles Conservation Corps. and the county Department of Parks to widen the park’s entrance, add more trees, upgrade the restrooms and plant a demonstration garden. This is fantastic news. The improvements build upon the bioswales, decomposed granite walkways and lovely picnic areas created by the nonprofit Amigos de los Rios less than a year ago. Once the new entrance is finished, people will notice the place more and visit. I hope it’s responsible people like those running for office, or living in the homes nearby from Monrovia, El Monte and Temple City. We need leaders to claim the park as their own and build on what Amigos, the county and the RMC started. Drop me an email and we’ll take a tour. I’ll fill up the tires on my bike. Oh, did you know Peck Road Park is where the Rio Hondo Bike Trail begins? I’ll race you to Long Beach.